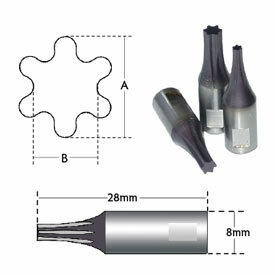 GenSwiss rotary broach tools are imported from Switzerland and are the finest broach tools available anywhere. 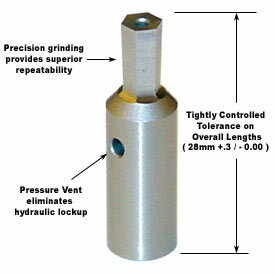 Generally held within .0004" of size, these rotary broach tools meet or exceed requirements set forth by the Aerospace, Automotive and Medical Industries. 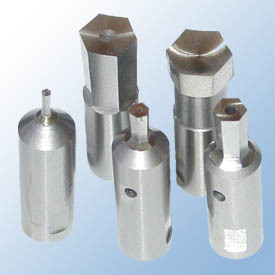 Standard Hex sizes are stocked as well as ISO 10664Torx style Hex Lobular Rotary Broach tools in a variety of standard sizes. Optional features include pressure relief vents supplied in the broach tool to allow trapped cutting oil and air to escape, preventing hydraulic lockup. 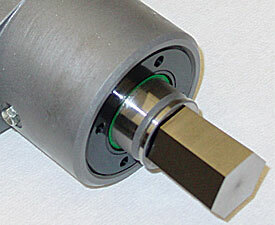 Modified dish on the face of the rotary broaching tool can enhance tool life in materials such as Titanium. 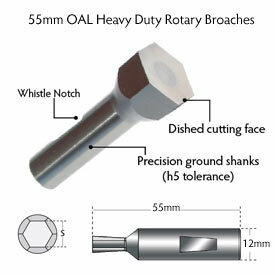 2110 Series Standard Hex Rotary Broaches are generally available from stock. If there is not a specific tolerance or broach size that you require shown below, please contact us for a quotation. We stock qualified broach blanks and can produce sizes to satisfy your specific rotary broaching requirements with fast delivery. GenSwiss now offers nominally sized rotary broaching tools that are competitively priced and intended for broaching standard nominal sized hex sockets. Offered in both Metric and Inch measurements our 2000 series broaches are ground to exacting tolerances based on the recommended specifications for standard hexagonal drive sockets. Material grade is ideal for non-ferrous broaching applications as well as machinable steels such as 12L14. Can also be used in stainless steel broaching applications however for Titanium and Stainless GenSwiss recommends using the 2110 series HiCo8 grade. --- .050" +.0010" / -.0"
1.3mm .051" +.045mm / -.0"
1/16 .0625" +.0010" / -.0"
1.5mm .059" +.045mm / -.0"
5/64 .0781" +.0010" / -.0"
2mm .079" +.045mm / -.0"
3/32 .0938" +.0015" / -.0"
2.5mm .098" +.045mm / -.0"
7/64 .1094" +.0017" / -.0"
3mm .118" +.06mm / -.0"
1/8 .125" +.0020" / -.0"
4mm .157" +.06mm / -.0"
9/64 .1406" +.0020" / -.0"
5mm .197" +.095mm / -.0"
5/32 .1563" +.0024" / -.0"
6mm .236" +.095mm / -.0"
3/16 .1875" +.0025" / -.0"
7/32 .2188" +.0025" / -.0"
1/4 .250" +.0030" / -.0"
HiCo8 Hexalobular Rotary Broaches have a torx like profile set to the ISO 10664 standard for hexalobular tools & drive bits. 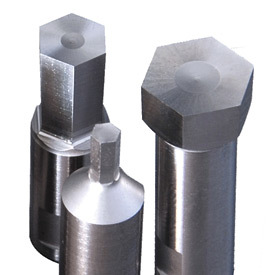 Note that when broaching profiles T-20 and higher, sizeable chips are formed in the process. This may require broaching in steps to ensure the chips are removed from the pilot hole before continuing to broach the profile.